For months, Donald Trump’s allies urged him to invest in the technology necessary to identify and mobilize his supporters, sources close to Trump’s campaign told POLITICO, but the billionaire barely budged, apparently believing his star power would provide a new way to mobilize voters. By the time his campaign began investing in voter data and targeting analytics, his rivals for the GOP nomination — particularly Iowa winner Ted Cruz and third-place finisher Marco Rubio — had spent millions building sophisticated voter-targeting machines. Trump’s campaign lacked the voter-targeting and turnout capabilities to translate a 7-point polling lead in Iowa into a win in Monday’s Iowa caucuses, and his disappointing second-place finish hinted at potential trouble for him in upcoming states that should otherwise be more favorable. Cruz and Rubio’s campaigns ran circles around Trump’s bare-bones operation, which gambled that Trump’s star appeal could overpower modern organizing tactics, and relied instead on big rallies, an outlandish social media presence, a flashy endorsement from Sarah Palin and a late advertising blitz to try to get supporters to the polls. The unexpected sense of generosity that marked Donald Trump's concession speech in Iowa on Monday night began to fray during his speech in New Hampshire on Tuesday -- and appears to have evaporated completely, given what Trump tweeted Wednesday morning. 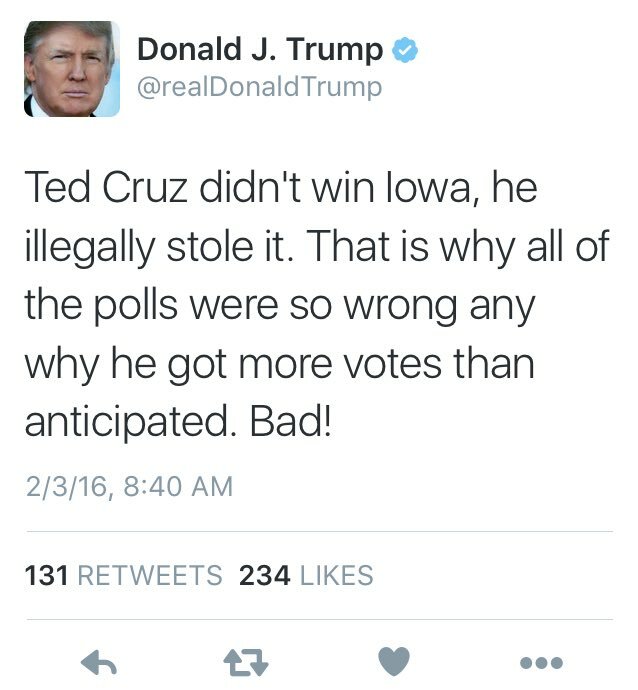 By the end of his tirade against Ted Cruz's Iowa win, Trump suggested that a new election should be held. Notice that the word "and" is written as "any." Trump has a habit of deleting tweets with typos and then retweeting them, which he did in this case, too. But he also took out the word "illegally."